We receive generous support from both the Milton Community Fund and the TD Friends of the Environment Foundation, as well as 'in kind' contributions of food and supplies. Support comes to Community Day in many forms, from many local businesses and volunteers from the local branches of the Rotary Club, the RCMP, and the Halton Regional Police. 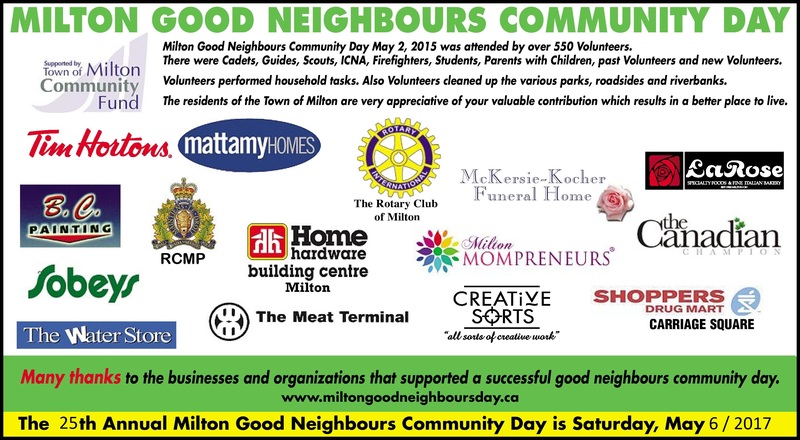 If you or your business would like to support Milton Good Neighbours Day, please contact us. Any assistance would be greatly appreciated. We recognized the contribution of businesses and organizations that have supported Good Neighbours Community Day in the Canadian Champion. In addition, we will be placing the logos of our supporters on the back of our T-Shirts that go out with every volunteer.